Every story is like a bridge between author and reader. Every story is an attempt to make a connection. And though it might seem like being as general as possible would allow a story to reach the most people, that's actually the opposite of the truth. In other words, we like details. We don't want to read about "the girl who went to the beach." We want to read about "the sweet child with hair as golden as the sand, who spent the day digging holes in search of those tiny clams that skitter down into the earth every time the tide rolls away." Even if the details don't match our personal experiences, they paint a better picture, and it's those pictures that stay in our minds, that remind us of our own picture-memories. "The flower garden was stained with rotting brown magnolia petals ... the oriole nest in the elm was untenanted and rocked back and forth like an empty cradle." Not only do they paint an incredible picture, but the words "rotting" and "empty cradle" also set the tone and foreshadow the tragic ending. "Nadya tried to get her mother to eat what little food they had, giving up portions of turnip and potato, bundling her mother’s frail body in shawls and seating her on the porch in the hope that the fresh air might return some appetite to her. The only thing she seemed to crave were little cakes made by the widow Karina Stoyanova, scented with orange blossom and thick with icing." Doesn't your mouth water just reading that? And the magic of specificity works on more than just nature or food. You can find it -- you should find it -- in the action, dialogue, and everything in between. "Koja darted forward and nudged her trembling hand once with his muzzle, then slipped back into the wood." Dart, nudge, trembling, muzzle, slip. Such delicious details. Many other YA authors do this well. Off the top of our heads, we'd say Rae Carson, Maggie Stiefvater, and Laini Taylor. Who else can you think of that gets specific in their stories? We'd love some recommendations of other books or writers to connect with! Ever since this TED Talk by Andrew Stanton (quotes are from his talk). I've thought about little else when it comes to storytelling. While his talk is called "The Clues to a Great Story," it might as well be called "Wonder." Because that's what I took away from it. This essential element is often what's missing from making a good book...great. "Capturing a truth from your experience." It's the thing that can't really be defined or explained in plain clothes. It's a character's tone of voice, and pitch perfect dialogue. An inspired setting that takes you outside of one world and places you in another. It's the thing that provides the framework for the reader to fill in the blanks. A good story makes you wonder what it's like to be someone else, somewhere else, with problems that are either exactly like ours or so different that it makes us feel like we have even a small sampling of control. It's that moment in "Close Encounters of the Third Kind" where Richard Dreyfuss makes a mountain of his mashed potatoes and says, "This means something. This is important." "We're born problem solvers...we can't help ourselves from wanting to complete the sentence, to fill it in...Don't give them 4. Give them 2+2." That's the wonder in story for me--the compulsion, the meaning, the purpose. It's not what initially hooks me, although wonder can do that. It's what captivates me, that makes me unable to stop reading. It's the open tap into human creativity, and writing that uses each and every word efficiently (not only for beauty). "Wonder is honest...it can't be artificially invoked." What was the last book (or any art) that made you feel a sense of meaning, or a shared truth, or just entertained the hell out of you? Noah St. John knows how to tell a story. Knocked our socks off. Zev knows self portraits. Made us want to be ten again. 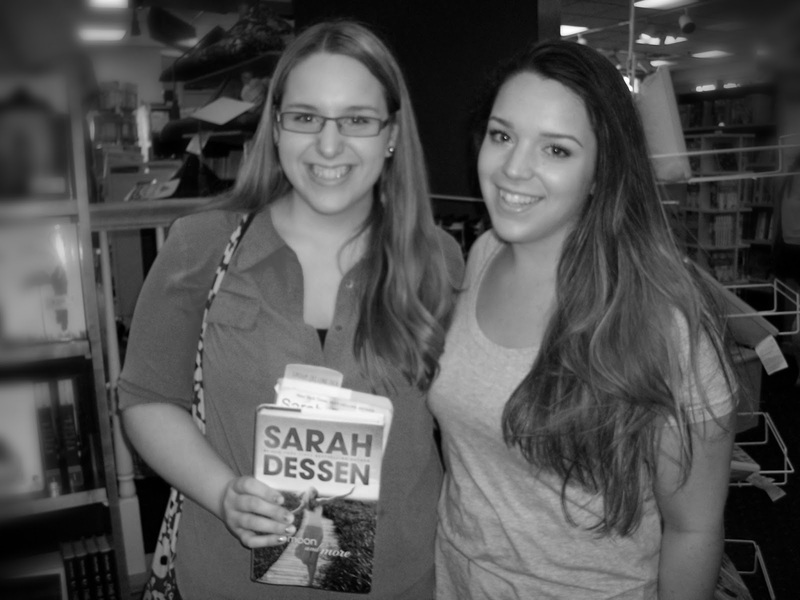 Don't forget to enter the contest to win Sarah Dessen's latest (signed) book...open until July 4th!! 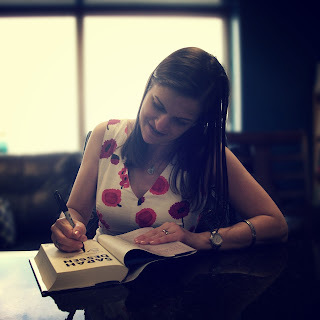 Last week, I had the privilege of interviewing Sarah Dessen at a signing she did at our local independent bookstore, Joseph Beth. 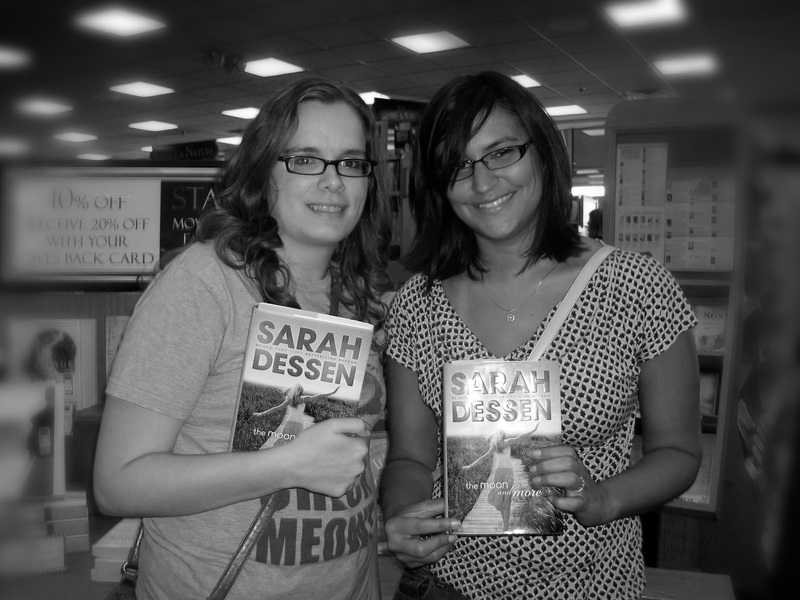 I arrived half an hour early, and I got to chat with Sarah as she signed books and got ready for the event. Enjoy! You published your first novel in 1996. You’ve been an author for nearly 20 years, and you’ve done countless events like these. What was your first signing like? 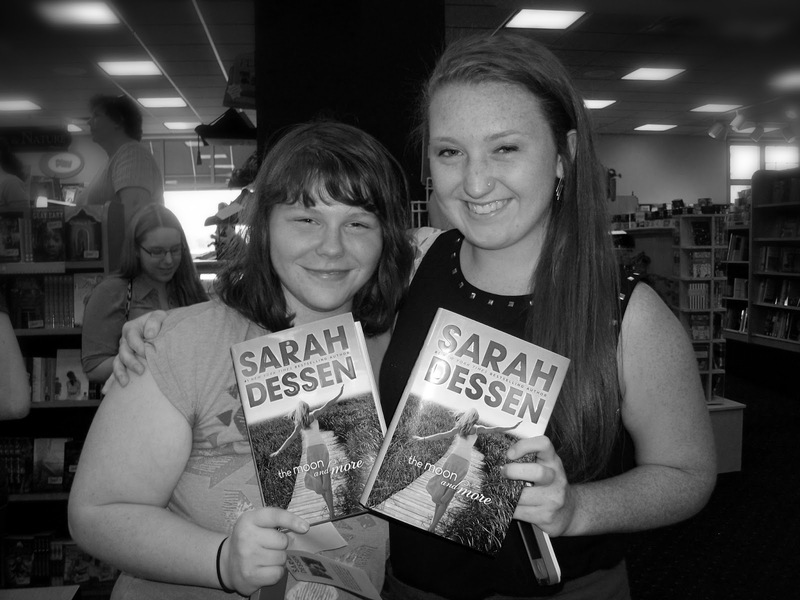 My first signing was at my hometown independent bookstore and everyone in the world came. It was so nice. My family was there, my parents, everybody I worked with, all my friends. So I had this great first reading with a like hundred people there. After those initial events where I had a ton of people come out that knew me, I would go somewhere else and there would be three people there. 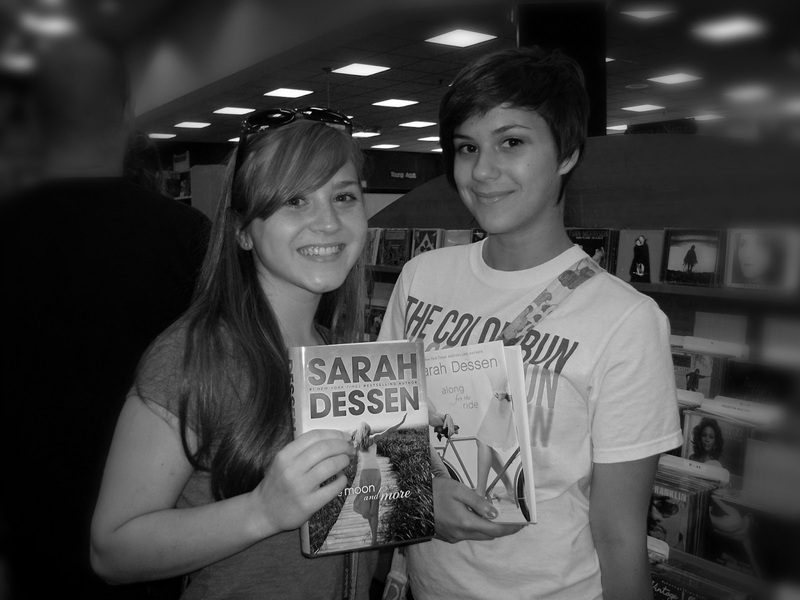 Two of them came with me and one of them worked at the bookstore. Over the years, I’ve gradually seen the crowds get bigger. It’s been this slow build. So now when I show up, if there’s anybody, I never take it for granted. What else has changed from the beginning of your career to now? I think when you’re a beginning author with any publishing company, there’s only so much they can put behind you. And I have so much support right now from Penguin. Also it’s the amount of readers invested in the next book. 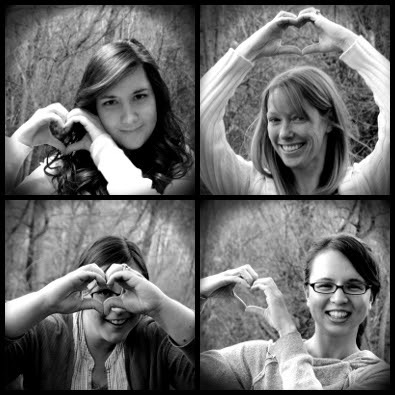 It used to be that nobody cared if I was writing, except my mother sort of cared just because she loved me. 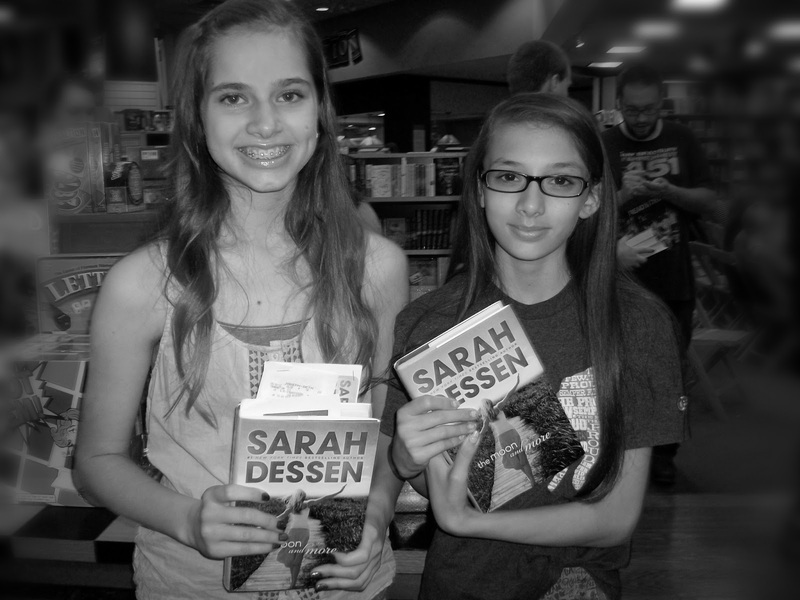 But now I have a lot of girls that are excited about the books and are waiting. And that’s like a double-edged sword in some ways, because they’re really enthusiastic and they can’t wait for the next book, but I don’t want to disappoint them. You’ve said in an interview that every time you finish a book you feel like you’ll never write another. What is it that makes you sit down anyway and do it all over again? I just get really jumpy. I say “squirrelly”. That’s the word I use. I finish a book, and I think I’m never going to write a book again. That was really hard. Then I have a little bit of time to watch bravo and eat popcorn, hang out with my friends and not think about writing. And it just starts to bubble up again. Even leading up to this tour, knowing that I really needed to be focused on [The Moon and More], I was very anxious about the book that I’m working on right now. It’s always there, it’s kind of this sense of just pushing forward and pushing forward. I always tell people who want to write — and this is usually advice that they’re already taking — is to read as much as they can get their hands on. You can take writing classes and talk to other writers and do writing workshops, but reading is how you absorb how other people handle dialogue, plotting. That’s how you see how stories come together. And I always tell people to work out a discipline. Try to figure out what time of day you write, because everybody is better at a different time of day. I write in the afternoons, because when I first started writing after college, I had a morning job and an evening job. The only time I had free was one-five, and that was my time when I wrote. So that’s when I write now. And if I’m not writing at one o’clock, I’m very aware it. Even on this trip, I feel like I left the iron on or something. There’s a lot to be said for just showing up everyday. And it’s not fun a lot of the time. For me it’s kind of like exercising. I never want to do it, but I know that once I do, I’ll feel good. You get going, and you hit your stride. Yes! Exactly. And you won’t ever get those unless you start. All of your books are contemporary. What is it that draws you to realistic fiction? I think I’m too lazy a writer to do something like historical fiction. You have to do so much research. I just write what I know. All of my stories, they don’t come from my high school experience, but they’re definitely based on things that happened to me in high school, or things that happened to friends of mine, or things that I wish had happened to me. I still live in the same town where I went to high school, so it’s not that hard for me to get back into that frame of mind. If you were to break out of your genre, what would you write? Eventually I would like to write adult contemporary, because a lot has happened to me since high school. I got married. I have a child now. But it would have to be very organic. Even though there have been contemporary adult publishers that have come to my agent and said “we’d love for Sarah to write an adult fiction book,” I’m afraid it would seem very forced. There’s something about the teenage voice that is organic to me right now. I just always wait and see what the next story is going to be. If the next story happens to be about a girl in her twenties, that would be great, but I feel very lucky to be where I am, and I don’t feel the need to push into other places. I’ve not started the new book. (I’m halfway through What Happened to Goodbye, and I’m really liking it.) Can you tell us what The Moon and More is about? It about a girl named Emaline who lives in my beach town of Colby. I always wrote about girls that went to the beach and had that summer that changed everything. So I was interested in what it would be like to live in this tourist town where everyone has these life changing experiences, but your whole life is there. And what it’s like to be permanent in a place that other people think of as temporary. It’s the summer right before she’d about to go off to college. She’s going to a state school with her boyfriend that she’s been with for three years. Everything is layout and very organized in terms of what is going to happen in her life. Then, as often happens in my books and in life in general, everything changes all at once. The summer after graduation from high school is the first time that I feel there isn’t one natural step in the next direction. A lot of people go to college, but there were people in my school who were going into the military, and there were people who were going to go straight to work for their parents. It’s the first time there isn’t just one trajectory, and I was interested in that. I’ve read that this one is a bit different than your other books. How is that? I think the ending’s a little bit different, not to spoil anything. I think it’s a little bit of an older book than some of the other ones, because it’s dealing with what happens after high school. It’s like as far as I go into the adult world, August before freshman year of college. Do you have a favorite scene is this book? Oh my gosh. That’s a good question! I love any of the scenes where Emaline is with her sisters. I like scenes where you have a bunch of women sitting around a table. Talking, bickering, arguing, you know? I first got one of the ideas for this book when I was coming back from the beach with one of my babysitters. She was in college, living in a big rental house with a bunch of girls. She was texting with them, and they were all hanging out in her room. And she was just like “I’ve told them a million times to get out of my room. My room is the only clean room. I keep it really organized, and they all go down there and put their drinks down without a coaster and mess up my bed.” So there’s a thing with Emaline that her mom and her sister are always in her room. So you said you’re working on something new already? I started something in January. It was going pretty well, but then it veered off in this awful direction right before I went on paperback tour in April. So I was forced to take a break from it. Then I came back and cut fifty-sixty pages. So I’m actually really glad I’m on book tour right now, so I have an excuse to not think about it. But once I get home and the dust settles a little bit, I’ll start writing again. After the interview, I joined the rest of the crowd, who were singing I Will Survive and giggling as they waited. 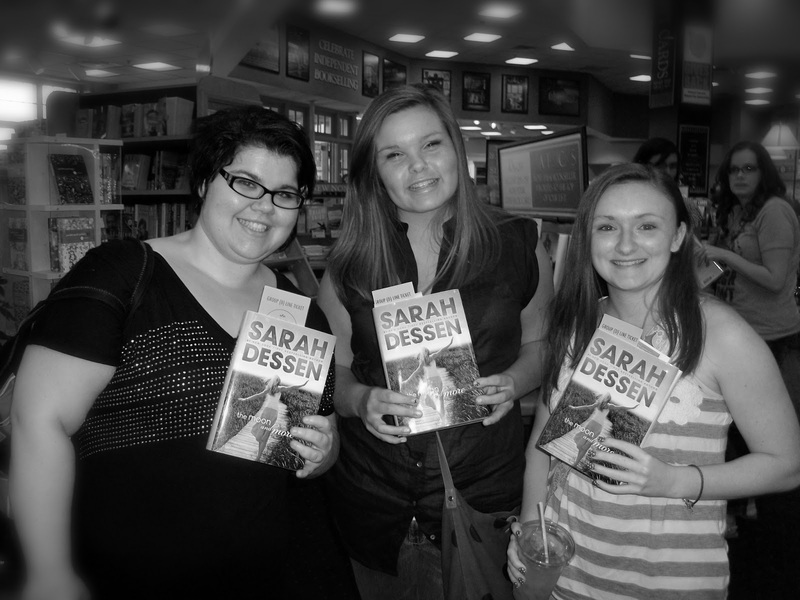 Sarah talked for a few minutes, read a couple pages of The Moon and More, took questions, did some trivia, gave prizes, and then got to work signing books for the long line that awaited her. It was such a fun night! I don’t know why, but when summer rolls in with its sizzling blacktops and sun-kissed days, I find myself drawn to the literary love. As in, capital R-Romance. Characters coming-of-age at sailing camp... teens having beachside bonfires... You know, those feel-good books that let you melt away from it all. Most of the time, I gravitate toward the tough stuff, the angst, the impossible predicaments authors dream up for their characters. So when I find books that lull readers into the summer bliss and tackle the big issues, well that's just... golden. TWENTY BOY SUMMER by Sarah Ockler... about love, loss and the lies laced in between. MY LIFE NEXT DOOR by Huntley Fitzpatrick... in which a young girl must decide whether her loyalties lie in the bonds of friendship, family or her one true love. 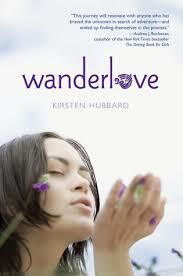 WANDERLOVE by Kirsten Hubbard... a travel adventure featuring Bria (a good girl trying to go bad) and Rowan (a bad boy trying to stay good). See what I mean? Golden. 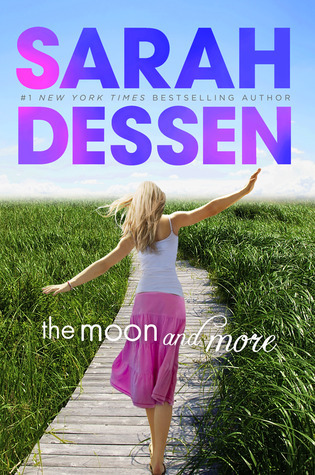 On my list this summer is Sarah Dessen's just-released THE MOON AND MORE. Has anyone read it? 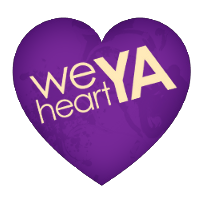 Weheartya's Stephanie is actually slated to interview Sarah D. this week and will be posting that interview here on Thursday! So what are your favorite YA beach books? Any new ones that you can't wait to get your hands on? Let us know and Happy Reading!